These days most people are preffering dogs as pets, once you have decided that you want a dog, the most important question you have to ask yourself is whether you want a small dog breed or a big dog breed. Do you know someone who has told you that he would like to have a large dog because small dogs are yappy and snappy, so my friends most of the time small dogs have a different temperament, then the large and medium ones, this is true, that small dogs gained the reputation of being rude, yappy, jealous and unfortunately it has being accepted all around us. The question is that why does a small dog act differently than the large one, they are similar types of animals, they are the mammal of Canidae family, so this type of animal has some instincts that needs to be fulfilled to make them happy. 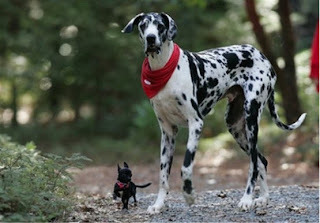 Let’s take an example, that how we treat small dogs and how we treat large dogs. There are many behaviors, that we humans allow the large dogs to get away, than the small dogs, like Jumping, Growling, these are the some trends that which we humans treat and differentiate in small and large dogs, If 80 pounds of German shepherd jumps on a human being, then everyone would be agree, that this type of behavior, that needs to be corrected, everyone find that their a problem and owner has to find and address the problem, however, if same type of act was done by some small yappy dog, nobody would take it badly, this is where we differentiate, the small and big dogs, in our own terms. So small dogs are never different, than the large dogs, what makes them different is their temperament and how we treat them, on one hand we treat the small dog as a baby, which we wouldn't do with big dogs. Thus we make the mistake by making this difference not the animal.